The Partiologist: Ice Cream Cone Cake Pops! I woke up to a field of cones. I know, cake pop cones are nothing new, in fact, I've made them before HERE & HERE. This time I wanted them to look like vanilla ice cream with chocolate drizzle. Being a chocolate girl myself, I didn't know if I would like all vanilla. In case you haven't had enough rain to grow your cake pops, I'll show you how to make them with this cute tute ~ it's a Game of CONES! I used Joy Joy Mini Cupcake Cones, are they not the cutest? Then I poked a wooden skewer through the bottom, and added a cookie stick. After making your favorite cake pop, add it to the end of the cookie stick. Dip the cake pop into the jar of melted white candy melts, and before all of it drips off, slide the cone up. It will stick the cake pop to the cone and leave a little puddle around the bottom. Just like a scoop of ice cream. Then I got out my wonderful bright stripe paper straws from the CakePopStand Co. They have a wonderful selection, in fact some I've never seen before. I love THESE and THESE and... oh I could go on and on, take a look at one more THESE. 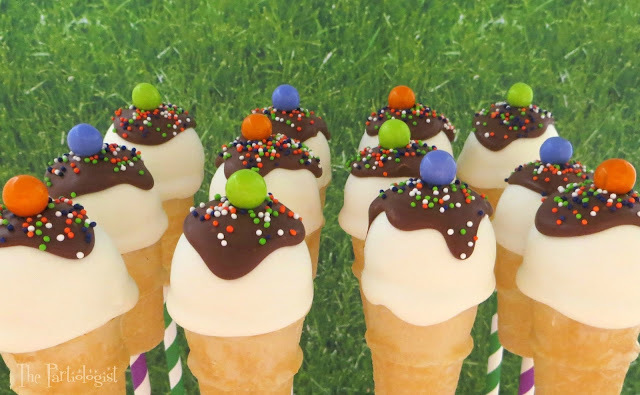 After finding just the right color sprinkles to match the cones, I melted chocolate (just a little, because we all know what would happen if I melt too much) and spooned a little to the top of each cone. Topped each cone with a bright Sixlet! 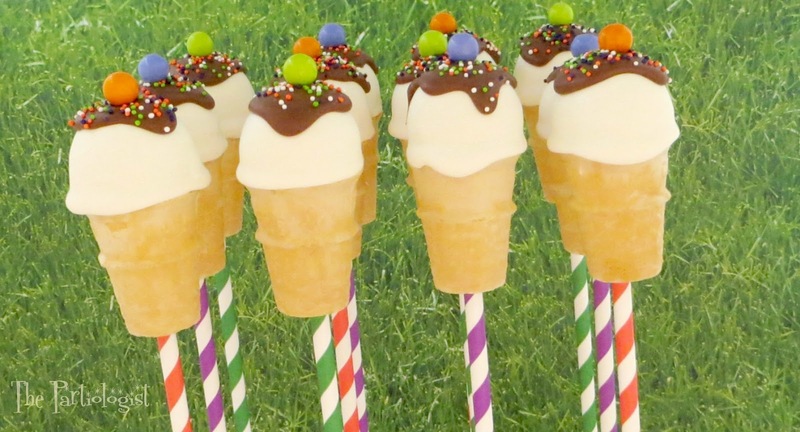 Now, go take a look outside, do you have any cake pop cones growing? I sure hope so! In fact, they did go to an end of summer party and had a great time until someone took the first bite! LOL Thanks for the comment! A new ice cream treat that won't melt! Awesome for a picnic! I love the fact that they won't melt in the hot sun! Thanks Lisa! I agree, those paper straws are the best!! Soooo cute and looks delicious!! Thank you Nicole for stopping by and the sweet comment! 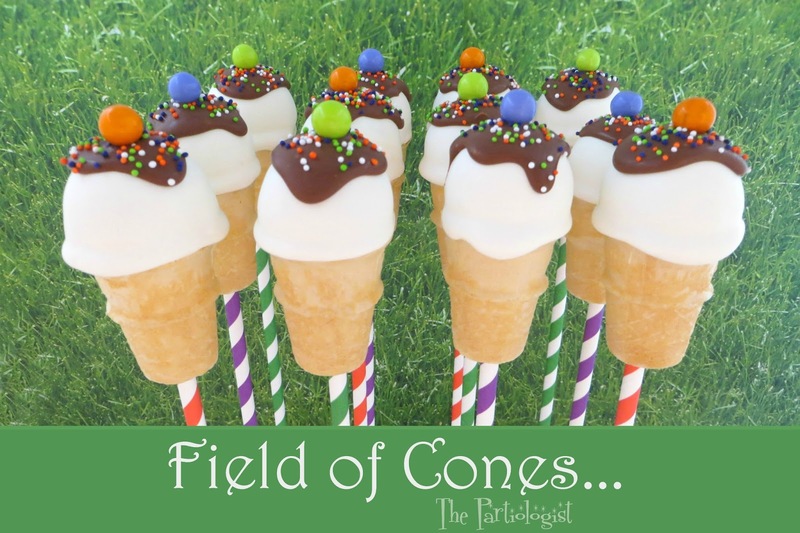 Yep, running through a field of cones would be pretty fun, right? Thanks Lisa! Aww, poppy pops, what a great idea - thanks Lisa!! I have looked all over the yard and...nothing! I guess we didn't get enough rain! These are adorable and sound delicious. I am a vanilla girl myself :) Thanks for sharing your great ideas! Sorry you didn't get enough rain - maybe next year! LOL I didn't know you were a vanilla girl - How did I not know that?